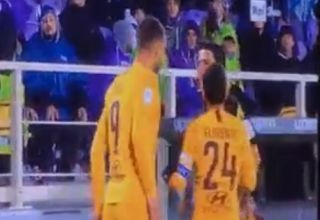 Roma striker Edin Dzeko got himself sent off against Fiorentina as the Serie A side suffered a heavy 7-1 defeat tonight. The former Manchester City star clearly lost his head in this moment of madness, spitting in the referee’s face from close range before unsurprisingly being shown a straight red card. Dzeko is usually a top performer for Roma and a source of goals up front, but this was not one of his finest moments. Despicable behavior by Edin #Dzeko.